The successful conclusion of the Forbes Purchase negotiations at Chiscatalofa on May 25, 1804 marks not only the beginning of John Forbes's debt collection campaign, it also foreshadows the U.S. debt collection campaigns produced from the U.S. Indian trading posts, one of which opened in 1804 in St. Stephens. It is an important anniversary. I have multiple references to Chiscatalofa over a period of about 55 years (circa 1760- circa 1818) and nowhere have I ever found that it was located across the river from Ft. Gaines. The Irwins did settle near Chiscatalofa but they settled on Irwins Mill Creek which has its source in Chattahoochee State Park in present day Houston County. I believe much of the Henry County historic marker text you read below is DEAD WRONG! That a historical society could erect a marker with such erroneous information seems to be quite a story to me, seeing that Chiscatalofa was located in present day Houston County and NOT Henry. I believe there is an excellent chance that you will find many errors in what passes as Henry County history. Found a couple of interesting maps in the Library of Congress. Have your papers to be copied in hand. Will be in the mail soon. 871. Map of a part of Pantonia laid out in sections. [Florida Gulf Coast]. Pintado, Vicente Sebastian. . Pen-and-ink ms., 81 x 63 cm. Scale 1:31,680. (Pintado Collection; Map 18). This map of the proposed Pantonia, the concession made to the Panton, Leslie Company along the Wakhulla River opposite Fort St. Marks, includes streams and other bodies of water, vegetation, determination of the quality of the land, tree types, and the division of the site into 83 sections. This map is related to the map under call number Pintado Collection, Map 17, Manuscript Division. 872. Map of A Part Of West-Florida [Florida]. [early 19th century]. Colored pen-and-ink ms., 85 x 55 cm. Scale ca. 1:158,400. (Jackson; 1). 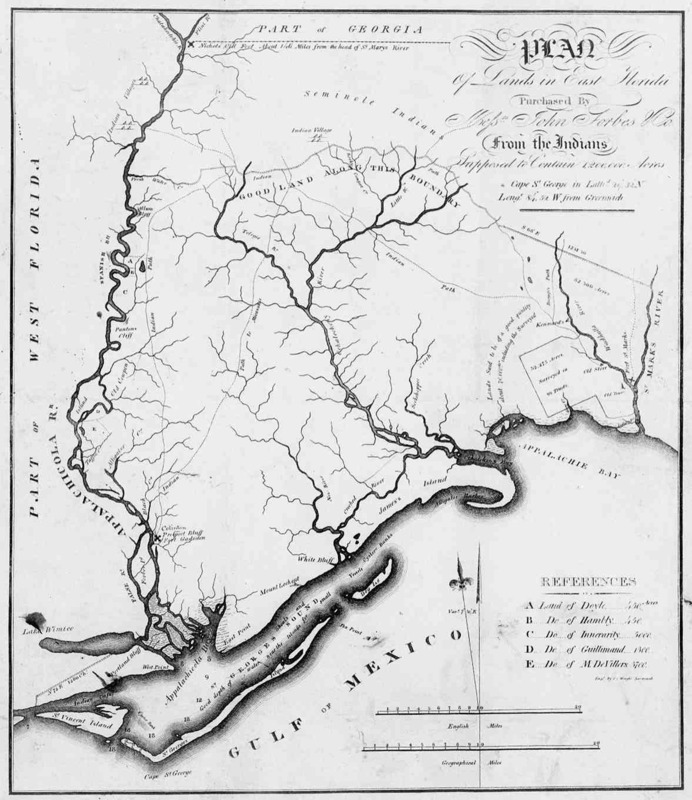 This map of the area along the Appalachicola River to the Gulf of Mexico includes rivers and streams, land owners, settlements, and trails to Seminole Nations. Alfred has dropped the project. The proposal for the study is still before the Faculty Senate,however, Alfred will not answer his home phone and I know that he has turned down interviews with NPR and the Wall Street Journal. His story is making the rounds on the Afro-American news sites on the Internet but he will not talk anymore about the University. Like my 15 year old son said, "He's afraid some redneck is gonna shoot him." He has agreed to get some information for me. One of his interns got some correspondence related to the scandal which occurred when Manly was elected to the Baptist Home Mission Board in 1844. Alfred has also promised to get the long letter from Manly to Governor Bagby describing his plans to design and superintend construction of the four slaves cabins. I will forward this to you when I receive it. The quote from the faculty committee who investigated the riot that ousted President Woods is very important. Manly's purpose in building a "palace" [The President's Mansion] was to establish an Imperial Presidency that would easily impress the young outlaws who entered the University and convince them that Manly was the right hand man of the Governor and one with so much power you wouldn't want to mess with him. He was successful in projecting this and he saved the University. Alfred found 160 acres Manly owned in West End. It's located on the west side of Moody Swamp Road where K.C. "Kid" Kelly has his junk yard and appliance shop. Manly's slaves reproduced so quickly he was forced to build a plantation in order to get work for them to do. In some of his papers he has 28 sharecropping contracts signed by his newly freed slaves in June of 1865. The 28 men signed an agreement to plant, tend and harvest 10 acres of corn each. I want to see those contracts to see the signatures. Most will be X's, however, some may have initials. Thank you for your interest and my progress will always be posted at "Cuba,Alabama"